On 14 October 2017 people from all over the world took action to protect our climate from fossil fuels. From groups fighting giant oil companies in Africa, to communities already feeling the impact of rising sea levels, the whole of Friends of the Earth’s global community united for a day of action. Our message to the world: keep fossil fuels in the ground. It’s our best hope of stopping the most devastating consequences of climate change. You can see what happened around the world here. In Sheffield, the day of action began at Weston Park Museum when Steve Goodacre and Liddy Goyder from Sheffield Friends of the Earth and June Bhooshi from Sheffield Against Fracking handed over three fossil fuel dinosaurs for safe keeping to Louisa Briggs of Sheffield Museums. The dinosaurs represented the 3 types of fossil fuels (oil, coal and gas) which must remain unused if we are to avoid dangerous climate change. Research shows that more than 80 per cent of the world’s known coal reserves, 30 per cent of known oil and 50 per cent of gas reserves are unburnable if we are to have a safe climate. Louisa Briggs of Sheffield Museums receiving 3 dinosaurs from June Bhooshi. After the handover of the dinosaurs, the group marched to Barker’s Pool to join other concerned residents for a mass rally with the theme of keeping fossil fuels in the ground, skipping fracking and moving to clean renewables. David Burley of Frack Free South Yorkshire introduced a number of speakers including Paul Blomfield MP for Sheffield Central and Shadow Brexit minister and Tina Louise Rothery a legendary anti-fracking campaigner from Frack Free Lancashire. A short video below features the highlights from the rally. A video on our Facebook site has the full set of speakers. Whilst the adults were listening to the serious messages from the speakers, the children enjoyed a number of activities from colouring in frack-osaurus dinosaurs to eating dinosaur cupcakes. The rally ended with music from Sheffield Socialist Choir and Sheffield Samba Band whilst inflatable dinosaurs were deflated to signify the end of prehistoric fossil fuels. The Star covered the rally in the printed edition on Monday 16 October 2017 and their on-line version has more photos and a video. A similar article appear in the Sheffield Telegraph. At the General meeting the group reflected that overall the event went well, with some disappointment that the numbers were not greater in Barkers Pool. 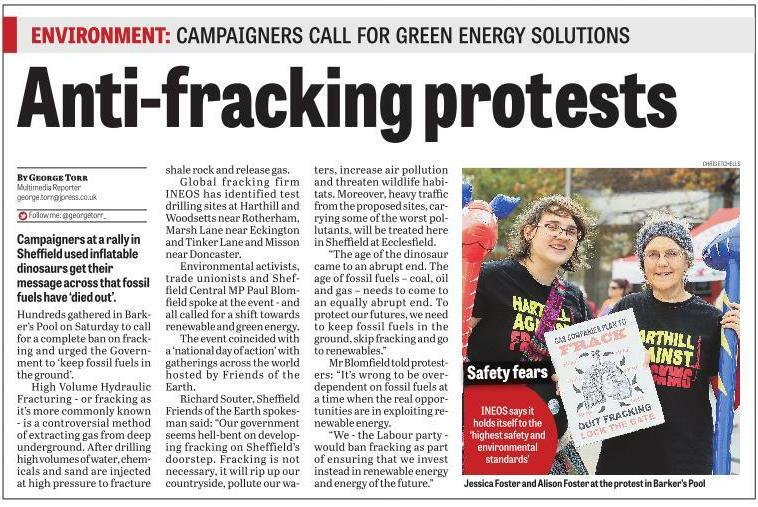 A lot of people, particularly Richard, Shaun, Mosborough Against Fracking and SCA and other groups who all contributed to making the rally happen were thanked for their hard work. Sincere thanks were also given to Michael Mouat for the filming and Prime Tiger Event Services for the PA system which many people said was excellent. Richard reported on an anti-fracking lunch with Jessica Ernst who has been responsible for a long running legal campaign in Canada. Will you give one day of your busy life to be part of a mass peaceful demonstration at the gates of a Fracking Site? Join “100 Protectors” a peaceful, mass demonstration, coach trip to KM8 Frack Site, Kirby Misperton, North Yorkshire. One way to affect this dirty business is to slow it down and send its costs rocketing. One way to do this effectively is to have so many Protectors/Demonstrators that the police are in the minority. We need at least 100 people to do that. With enough people willing to go for one day: you’d only have to go once a year! To be notified of the dates please send your email or phone number to Disgruntled@riseup.net The first trip is looking like one day week 13th-17th Nov.
A walk with talks and singing in Sherwood Forest, about fracking and the history of land rights, by amazing performers Three Acres and A Cow. Sign up to the Facebook event here. Afterwards, there will be talks & discussions at the nearby South Forest Centre – book tickets for this here. A Burns supper is being organised to support anti-fracking campaign for 20 Jan 2018. watch this space for more details. Shaun will ask Jo if we can advertise trips on the website. Richard will circulate update from David Burley.